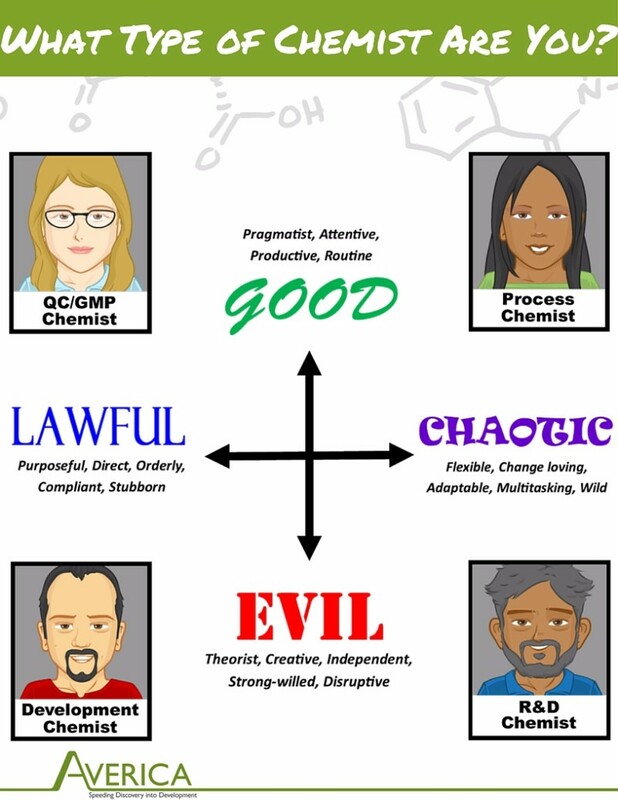 Have you ever noticed there isn’t a personality chart for chemists? There are plenty of chemistry roles in drug development, and we believe certain character traits enhance our ability to excel. We’ve started this discussion using an alignment plot, and welcome all to join in our fun. Are you a chemist? Where do you fall on the matrix? Not a chemist – where would you be? Want to know where we fall? Our lab mostly falls into the Lawful/Evil spectrum. Not in any malicious sense, of course. This comes down to what we do, which is in large part thinking outside the box and problem solving. For example, when we develop a method we think of both immediately needs and those further down the timeline – while method development itself may be disruptive, the goal is an orderly system our clients can use. Sound like your style? Take a look at our careers page. Want to learn more? Click this link for more information on the origin of the original alignment plot.